There’s something else I’d like to show you. The Borough Press posted a special on how the cover was designed and I think it’s worth a read. You can find it here. Young Tom Walker cannot believe his luck when his father allows him to accompany him on the road, selling Samuel Colt’s newly-invented revolver. They will leave behind the depression and disease that is gripping 1830’s New York to travel the country together. On the road west the towns get smaller, the forests wilder, and the path more unforgiving. A devastating encounter cuts their journey tragically short, and leaves Tom all alone in the wilderness. Struggling to see a way home, he finds his only hope: ageing ranger Henry Stands, who is heading back east. Tom’s resolve to survive initiates an unlikely partnership that will be tested by the dangers of the road ahead, where outlaws prowl. 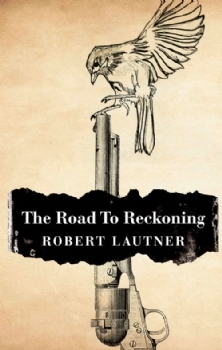 Set in the early 19th century, The Road To Reckoning takes us on a trip to the American frontier. Thomas Walker and his father make their way from New York to Pennsylvania and as I’ve never traveled that road, I had problems imagining the landscape that surrounded Thomas on his adventure. Too often, my mind created Wild West scenes where the woods and meadows of Pennsylvania should have been. Twelve-year-old Thomas Walker is the main character in The Road To Reckoning. By letting the adult Thomas Walker narrate what happened in his childhood, Robert Lautner avoided all the difficulties that come with stepping into a little boy’s mind. This approach also added a touch of nostalgia to the tale which fit perfectly. I also really liked the character development of Henry Stands. I don’t want to take away too much, so you’ll only get three words: What a man! The Road To Reckoning is an exciting tale that has everything you expect from a western-style adventure: horses, dirt, bad guys and guns. It reminds me of the western novels my father used to read when he was a boy. The Road To Reckoning might look like it’s targeted at adults, but I think teenagers will also take pleasure in a trip back to the American frontier.